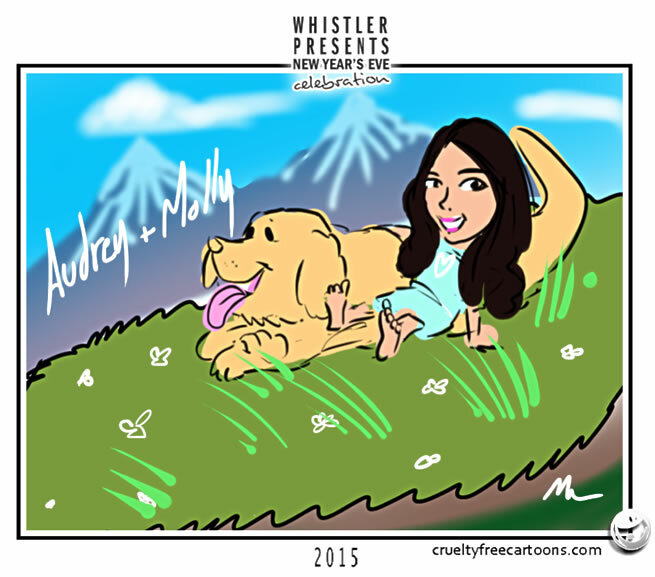 The latest event I drew caricatures at was the First Night celebration in Whistler. BC Canada. This is my tenth consecutive year doing this particular event. Whistler attracts people from all over the world and I really enjoy meeting and getting to know them. I also get to see the same awesome people from year to year as well. There are families who have come to see me 5+ times and have told me that they make getting their picture done by me a priority on Whistler First Night. This is very humbling for me because due to the popularity of the cartoons my line can get very long. Their enthusiasm for what I do is gratefully appreciated! This caricature is one of my favourite from that event. This girl told me that her most favourite thing to do is it sit with her dog in a big alpine meadow covered in flowers. She was so happy with it where I could feel her joy. Sometimes the simplest things bring the greatest pleasure!